Photo of the Fumo Family Branch, 2437 S. Broad St.., oversaw a Haunted Carnival Oct. 28. 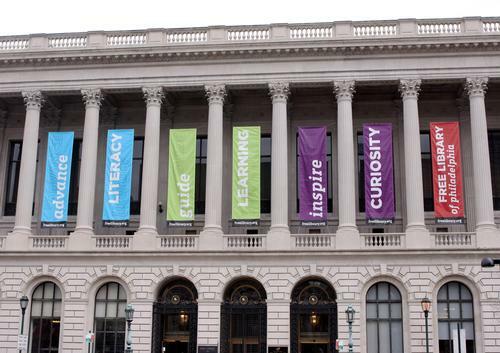 The Free Library of Philadelphia has elected Jeffrey Cooper to its board of trustees. Cooper is vice president for government and community affairs at the University of Pennsylvania. He also identified many fraktur artists, including Samuel Bentz, Conrad Gilbert, and Daniel Otto, and with librarian Howell J. Heaney he wrote the two-volume catalog about the fraktur collection at the Free Library of Philadelphia, published in 1976. Nineteen of Taylor’s 26 K-3 teachers were among about 700 who attended the training, which was grant-funded as part of the city's READ! by 4th campaign. Poll: In Honor of #FLPNoShameNovember, Which Guilty Pleasure Should We Own Up To? Throughout the month, the Free Library of Philadelphia is sponsoring a No Shame November initiative in which the city’s residents are encouraged to embrace and discuss the books they love that might be considered guilty pleasures. It’s a smart bit of marketing that allows individuals and organizations to discuss their #FLPNoShameNovember choices on social media, raising awareness about the Library along the way. In Philadelphia, for example, the Free Library’s Techmobile functions as a traveling digital literacy triage center, and the library serves as a critical node in the KEYSPOT network of public computer centers, which provides frontline technical and social support to the city’s most vulnerable populations. In 2016, CHOP will launch a South Philadelphia program in partnership with City of Philadelphia's Department of Public Health, the Department of Parks and Recreation, and the Free Library of Philadelphia. Opening in 2016, this first-of-it-kind hospital-city partnership will include a CHOP pediatric clinic; full-service community health center run by the City of Philadelphia's Department of Public Health; branch of the Free Library of Philadelphia; and modern recreation center with playground and green space, run by the city's Department of Parks and Recreation. The Roxborough Library branch of the Free Library of Philadelphia held a special program on Monday night on organizing homes in the city for children. She also volunteered as a literacy coach at the Philadelphia Free Library, often teaching English as a second language. He will also talk about the creation of 'One Land...' with Nezet-Seguin at a panel discussion in the Free Library of Philadelphia. Haunted Carnival, Fumo Family: Join us as we transform the library into a Haunted Carnival!